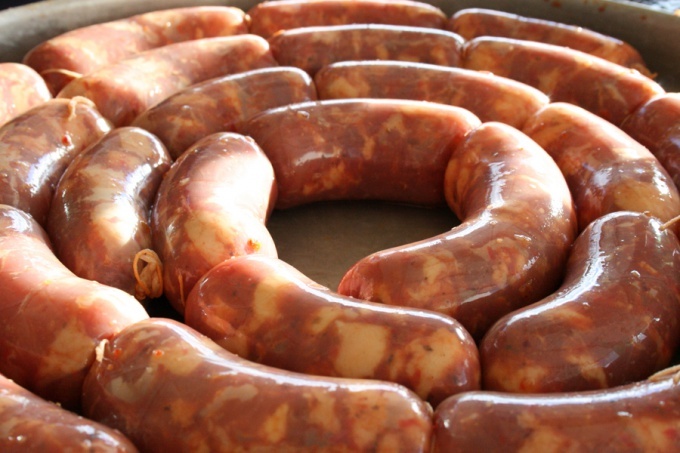 Purchase taste of the sausages is poor, therefore, are increasingly popular products prepared by themselves. 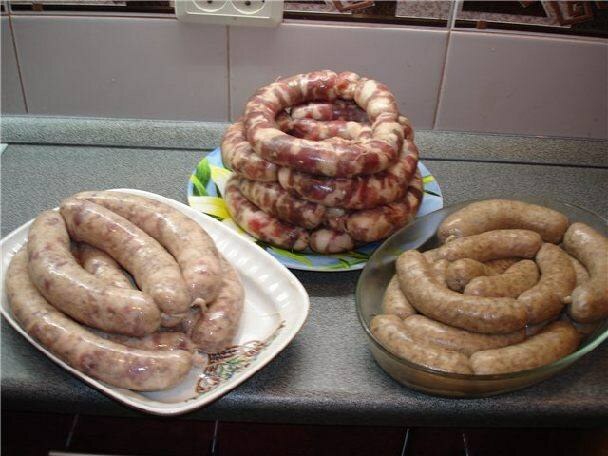 The sausage at home to make easy, there are many different recipes. The sausage is unthinkable to do without the shell. For making the homemade product, you can use the guts of large and small cattle and swine, and edible gelatin sausage casing. For home-produced often use a Cup (or caraway. The villagers who keep animals on a farmstead at the bottom of their gut is not thrown away. They are released from the contents, washed, cleaned with a round stick, grind with salt, rinse in water with vinegar and stored in the refrigerator or in cold water. For long term storage of salted guts cool, before applying them soaked. Processes the intestine only fresh, had lain for some time already unusable. For sausage casings treated with the small intestines, the bladder, the esophagus is time consuming and unpleasant task. Now no need to fiddle with the guts, the meat departments of supermarkets and meat shops offer ready-made natural casing for any meat products. Today the stores boast a large range of products – beef casings, filling from 10 to 50 meters, pig intestines, pack of 90 meters, lamb chitterling and other. Dry intestine before use, soaked for a few hours, even for days, salted casings should be wymacet. Natural casing is permeable to steam and smoke, can withstand all kinds of heat treatment and sausage in cereve you can grill them. Sausage in natural shell after cooking gets a nice Golden color and smooth surface. But there are also disadvantages of this product is: natural, not canned, guts stored a long time; have a specific smell. Guts sausage casings can be bought in the online store, it is simple − it is necessary to find a reliable, trustworthy shop to choose in the catalog of the desired products and make an order. Delivery is made by mail Russia in any remote area. Casings are Packed in vacuum sealed bags. So today is not a problem to buy natural shell and cook a delicious, high quality homemade sausage. Our grandmothers, without a doubt, an excellent hostess. They have shelves Laden with home preparations, and the cellar was filled with the aroma of various homemade sausages and smoked hams, which are not comparable to the chemicals in store-bought products. But to cook a delicious sausage in home conditions is not difficult. To separate the meat from fat. It should be about four times more fat. Cut into small cubes and stir. Peel the garlic, chop with a knife and put in the meat. Add salt, black pepper. Mass mix well and put to infuse in the fridge. At this time, to prepare pig intestines, which be purchased in advance on the market. If they are saline, they should pour water, wait until the salt is dissolved and rinse well. Check to the gut for sausage was not damaged. To cook a meat grinder, instead of the lattice is put on a special nozzle for sausage. Meat passed through a meat grinder to fill the guts of 10-15 cm, and then catch up with her a strong thread and tie. The resulting sausage cut and fill the next and again knotted. And so, until all the mince. The sausage fried until crisp and served hot on the table. It can be podkoptit or podvyalit, then a homemade pork sausage can be stored longer. In the latter case, the amount of salt in the recipe increases.